Sunday night: Gradual clearing. Lows in the mid 50s. Monday: Gorgeous. Sunny, less muggy and warm. Highs in the mid 70s. Tuesday: Mix clouds and sun. Cooler. Showers. Highs in the upper 60s. 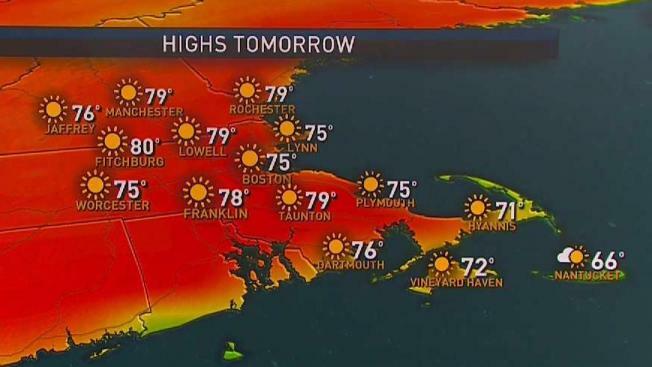 Temperatures reached the low 80s on Sunday, a significant turnaround from Saturday when we recorded a high temperature of 55 degrees at Logan Airport. Temperatures will likely fall short of 80 degrees for the remainder of the 10-day forecast period. Monday will be magnificent – low humidity, sunshine and mild air. Temperatures will reach the mid 70s. Tuesday will be cooler and slightly unsettled with a few showers around. High temperatures will climb into the upper 60s. Wednesday is warmer with highs in the mid 70s and it will be dryer. Although a brief shower can’t be ruled out, much of the day will be quiet. The work week will close out on a warm and sunny note. High temperatures will be around 70 degrees on Thursday and in the mid 70s on Friday. Unfortunately this luck won’t carry into the holiday weekend. Currently, Saturday looks to be the driest day of the three-day weekend. Showers are possible, but it doesn’t look like a wash out. Sunday, looks a bit more unsettled. Those shower chances will continue into Memorial Day. Although we could be wet, at least it will be warm.